The unique design of the Trail Blade is based on the cutting edge blades of designer Jared West, of Quartermaster Knives. Atturo partnered with Jared to create something fresh in the LT tire segment. As the styling of the tire has become almost as important as the performance, they sought a unique blend of the two. Atturo selected knife blades to incorporate into the tire design based on their intended use as a gouging or clawing type tool. The shoulder and corresponding sidewall tread blocks are based on a pusher style double tipped blade, even including the contoured edges. The alternate sidewall lugs are from the Karambit type blades. All Atturo tires have a (3) three year manufacture’s defect warranty. This warranty only applies to the original purchaser of an Atturo tire and is not transferable. Eligible tires must be purchased new and must be used on the vehicle for which they were originally installed. Additionally, all tires installed must be of an equivalent or greater load index to that specified by the vehicle manufacturer. The load index is the numerical designation imprinted on the sidewall of the tire and corresponds to a specific load carrying capacity. (Marks such as “Load Range E” or “10 ply rating” are NOT a load index as they do not correspond to any specific load carrying capacity. These legacy markings may NOT be relied upon for accurate applications of load capacity.) All tires must also be mounted to a wheel within the approved rim width of the tire. 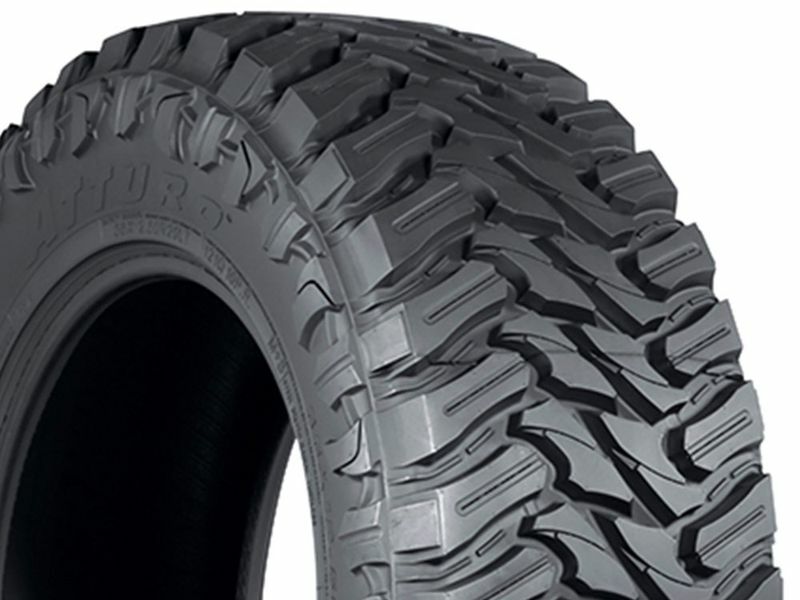 Each tire has a specific rim width range on which the tire can be mounted. Failure to follow rim width recommendations may result in poor tire performance or possible wheel and/or tire failure. All approved rim widths can be found in our catalogs as well as on www.atturo.com For warranty exclusions see “WHAT IS NOT COVERED”. If an Atturo branded tire becomes unserviceable in the result of an eligible adjustable condition during the first 2/32" of tread wear, it will be replaced with an equivalent new Atturo tire, at no charge. When the tread is worn past the first 2/32", if the product exhibits an eligible adjustable condition, it will be replaced on a pro-rated basis. You must present proof of purchase and be the original owner when requesting a replacement for your tire. You must pay for mounting, balancing, and any other additional charges, such as taxes or the acceptance of a higher priced replacement tire. Any Atturo tire that does not deliver satisfactory service due to a confirmed balance, out of round or a ride complaint issue will be replaced without charge within the first 2/32nds of the tire’s tread life. After the first 2/32nds the tire is not warrantable. The tread life/mileage warranty does not apply to the following conditions: Tires used in commercial applications including but not limited to, police, taxi/limo/Uber/Lift or similar Ride Share transportation service, national account, government and contract sales. Tires supplied as original equipment. Tires on any vehicle other than the vehicle on which they were originally installed. Atturo has mileage warranties for the Trail Blade X/T, Trail Blade A/T, AZ800, AZ610, and the CV400. Unfortunately, due to the variety of use, road conditions and geographic influences encountered across the country, all consumers may not receive the warranted tire mileage. To qualify this limited warranty, the consumer must complete specific maintenance requirements. Tires become legally worn out when they reach 2/32” of remaining tread depth (shown by tread wear indicators molded into the tread grooves). Atturo will consider a mileage warranty claim when one or more tires has been worn to at least 3/32”. Tires that are properly maintained should wear evenly and the rate of wear should be consistent on all tires on the vehicle. Tires with uneven wear or variances of more than 2/32” between the tread depths of the outer, center and inside grooves will not be eligible for warranty consideration. The consumer will receive a pro-rated credit toward the purchase of a replacement Atturo tire, based on mileage not achieved by the warranted tire. The consumer is responsible for the difference plus the cost of installation, balancing, etc. Atturo warrants tread life for up to 5 years from the date of purchase. Certain Atturo tires, such as the Trail Blade BOSS, Trail Blade M/T, AZ850 and the AW730 ICE are not covered by a mileage warranty. Atturo makes no claim or representation of how many miles/kilometers these tires will last. Tire life can vary, depending on vehicle condition, road conditions, driving habits, proper maintenance and proper inflation. If you are changing your tire dimensions from stock you will want to have your speedometer & odometer recalibrated after installing your tires. Changing your wheel or tire size can affect the accuracy of your gauges as well as how your transmission shifts. To check out the tire recalibrators that we sell click here. If you have any questions or concerns please feel free to give us a call.